We've cracked the code to the World's Best maskless, hoseless, and cordless CPAP! You probably don't believe us, right? Well, it's true! You have to try it for yourself to believe it. We've spent countless days, weeks, and months testing, developing, and researching this amazing device. We are beyond excited to introduce this revolutionary product that helps combat excessive snoring, sleep apnea, and sleep problems. How does it work? Basically, when the soft tissue at the back of your throat falls, you begin to snore. Some people experience an extreme form of this called Obstructive Sleep Apnea (OSA). This leaves the sufferer with an airflow blockage. 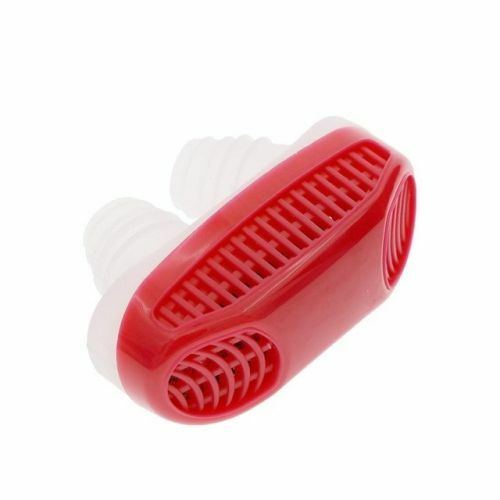 Our innovative anti-snoring apparatus is designed to encourage a positive airflow to travel through your nasal pathway. This keeps the soft-tissue from collapsing at the back of your throat. Well, that's simple! Our device is made with a plethora of air filters and micro-screens. The carbon filters purify and accelerate the intake of your air. In unison, the micro screens in the exhalation vents behave like pressure gradients in order to minimize the amount of air lost each time you breathe out. Working together, the aforementioned elements of the unit increase your air intake without allowing excess air to escape. This creates a positive build-up of pressurized air. This type of continuous pressure build-up inhibits soft tissue at the back of the throat from falling while you sleep. The end result? No snoring! We encourage you to order your GoodSleep Anti-Snore Device, today! This micro-CPAP device has changed the lives of thousands of people all over the world. Will you be next?